You can find all Book Trailers from WAMM Publishing on their site -- www.writersamuseme.com -- click on the book trailer link!! For now -- you can watch ENTER ETERNITY book trailer here anytime!! Hope you enjoy!! VERY PROUD TO INTRODUCE THIS ONE!! WHY?? CUZ IT'S MINE!! More Amazing trailers!! Keep 'em comin WAMM!! Let's add a few more!! Latest book trailers for WAMM!! Amazing!! Yep!! That's what the title is---Book Trailers!! Why? Well, recently my publishers at WAMM decided to take another step forward!! Their site is upgraded and so, it only made sense to upgrade the authors & their works! I will post all the trailers here but please don't let that keep you from going directly to WAMM http://www.writersamuseme.com/ to check out all the latest book releases, blogs & another look at all these amazing trailers! You will find all these authors, their books on the shelves, an inside look into every author and much more! Check out the link for The Writers Block http://thewritersblock.forumotion.net/ if you are interested in joining a great group of writers! Ya never know where you'll find me!! Hope you enjoy the trailers---I will add more as they are completed! I am very excited to have my very first guest blog! It is that much more exciting to introduce to you one of my favorite authors (as I have several) from WAMM Publishing… Tony Walkden. 1. Hiya Tony and thanks bunches for joining me for my guest blog. Let’s start by introducing your debut book. Thank you so much, Honey, for talking to me. My debut book is called With A Dying Breath. This book is about endangered animals, why they are endangered, and what we can do to help them. It is intended to make people realize the hazards, the majority of them caused by humans, that these animals face in their fight to survive. There are some in the book that are starting to rebound with help, but there are also some in the book that have virtually no hope short of a miracle. Overall, many of the animals talked about in the book are ones that we are in a great position to help… if we have the will. 3. How long did it take you to research for this? This started as a school project – I was homeschooled. As I worked on it, added more animals and more geographic regions, it grew. In all, it took me almost four years to research it then get it all put together. 4. Not everyone knows that you are diagnosed with Autism. Did this hinder your passion to write With A Dying Breath? Because of my autism, there are some things I can do very well, but there are other things that are very difficult for me. One of the things that is extremely difficult for me to do is to write. I can read, but I struggle when I have to think of a letter then send that message to my hand so that it can write. That was one of the reasons we started this project – to help build that skill in me. In order to do the book, I made my notes for each animal then used those notes to make sure I had all the information right before I told it to my mom for her to type it up. She cleaned up my grammar mistakes as we went along. 5. Also not well known is the fact that you have chosen to donate all of your royalties from your sales to IUCN (International Union for the Conservation of Nature). Why? The IUCN is the organization that monitors animal and plant populations around the world. They work with local governments and conservation groups, maintaining the Red List that rates animal species as vulnerable, endangered, critically endangered and extinct in the wild and extinct. They help identify the problems that each species faces, then tries to find the best way to help those populations, including by making the public aware. Their work is critical to the survival of thousands of animals. By donating to them, we can help monitor these populations, identify other species that are in trouble before it’s too late, identify new species, and get groups working locally to educate people about conservation. We never really understand, until it’s too late, what the loss of one species can mean to all of us, even when that species is something we have never seen in our lives. They, and we, are all connected in a web of life, so when one is weakened or removed, others weaken as well… it might take a while and be several species removed from us, but eventually it will impact us. 6. You received an awesome review from one of the best known Wildlife Advocates, Mr. Jack Hanna. How did that feel? Amazing! He was very gracious to me and very complimentary about my work and the research that went into it. I have also heard from David Suzuki, and just this week, I received a letter from Phillipe Cousteau (Jacques Cousteau’s grandson) thanking me and complimenting my work. To receive any acknowledgement from these people who have dedicated their lives to helping wildlife and conservation is amazing. 7. You are a very dedicated young man! Do you see any other books in your future? Yes. I am thinking about a few more right now. One of the problems we had with my current book, With a Dying Breath, was locating pictures of each species. We managed to find, with the help of pictures and artwork donated from over 70 different people around the world, to get pictures of all but three species, but it’s something I bear in mind when thinking of the next book – the availability of the pictures. However, I would like to do a book about introduced and invasive species – ones that are brought to a new area, often for recreational purposes, which then go wild and take over, leaving native species to perish. They aren’t always bad, but they still impact local populations and need to be thoroughly controlled. I would also like to do a book about recently extinct animals – in the last five thousand years, so not as far back as dinosaurs but far enough back to include species such as the atlas bear. Of course, I would love to do another book about endangered animals again. The list is always changing. Even while working on the book, some animals were removed from the endangered list (they were then designated as vulnerable) while one, the Baiji (a river dolphin in India) was declared extinct. 8. Knowing your passion for wildlife, if you could go anywhere in the world, where would you go? That’s a hard call. It wouldn’t be Europe because there are not a lot of wildlife species there. Africa and Australia would be top on the list, but the Amazon would also be amazing. There are some islands in the Indonesian archipelago that would be wonderful to see with their many unique animals, as well as India. There is also the Galapagos, Madagascar… I really can’t pick one place. They would all be amazing. If I am travelling in North America, any place with a well accredited zoo would be wonderful. Yes, I go to zoos. I think they do some amazing work in educating people about animals. They also are a critical component to the survival of many species. Without our zoos, we would be missing many animal species by now. Their breeding programs are very important. Their contribution to rescued animals also has to be considered, so yes, I believe zoos can do good. I enjoy watching television, especially shows about nature, and I like to look at books, also about nature. We live on acreage so I have plenty to keep my busy there. I also like computer games and shooting pool. That’s easy. My mom. I even get to help with some of her writing, especially her series that goes around the world. I’m helping her with plans for her Cabochon book in the Urals and the one in Madagascar. I helped out with the ones in Ecuador and Tasmania, and we are working on the one in the arctic. I hope she also does at least one in Africa – South Africa would work, or in Tanzania or Kenya. Thank you all for joining Tony and me today. Hopefully, I was able to provide you with a little insight into Tony’s world. What an amazing young man and an awesome future ahead! Tony, thanks bunches again! We all hope to see where you will go from here! Please keep us posted on your future works. Join me at a later date, to be announced, for more guest blogs! This tradgedy today has prompted my publisher to pull together all WAMM writers for a small gesture to be extended to the families of those affected by this. Please read her words below and join in with our writers community to offer what little comfort we have to offer. LIKE the SANDY HOOK ANGELS facebook page, give suggestions for ways, we as writers can come together to help ease the pain of these senseless losses. Nothing could take away the pain these families are feeling from today's events. Grab your children today and tell them how much you love them, then do your part with us in an effort to let Newtown, CT. know, they are not alone. This author, this publisher, this writer's group, this family, this country cares for them. In a time like this, we all need to come together if only to express our feelings, our sorrow, our blessings. PLEASE, join us in this effort! Things have kicked into high gear! As you listen to FOOL ME ONCE's Chapter 23's Title Song, Waiting For The End To Come, I will fill ya in!! 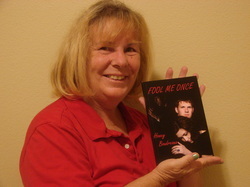 With the release of FOOL ME ONCE, the excitment level has increased ten fold. I have said it before and I will say it again, www.writersamuseme.com has made this the most pleasant experience an author could ever have! Their support system, their marketing ideas, their family atmosphere has left other publishing houses in the dust! Sure, I could sit back and allow an agent to do the work... but damn, why?!? I'm a hands-on type of person so there's no reason to have a middle man! With ideas of my own for marketing and passing my thoughts through WAMM, we have a plan set to put into action! Personally, I can't wait to promote not only my own book, but the books of several other WAMM Authors! This is truly a team effort for all of us! With great authors like Dave Smith, Mary Cote, AmandaLyn Donogal, Tony Walkden, June Kramin, Ann T. Bugg, Trish Stewart, DeeJay Arens, Shakey Smith, Stephen L. Park, Tom Byrd and several new Authors to add to the list.. who could go wrong!? Welcome to the family Heather Gregson and Michael Frissore! Can't wait for your November releases! Geesshh, I hope I didn't leave anyone out! Now for the really exciting news! Really peeps... not 1, not 2, but 3 of WAMM's Authors have been nominated for the IPPY Award!! An award given by Jenkins Group for Independent Publishers! What an honor for Dave Smith - OUTSKIRTS OF INSANITY; DeeJay Arens - THE VIEW FROM A RUSTY TRAIN CAR; Stephen L Park - BOOTS-An Unvarnished Memoir of Vietnam!! Now I ask you-- who wouldn't want to be a part of this amazing group? I'm definitely proud to boast... and while I'm boasting... A HUGE CONGRATS to Tony Walkden - WITH A DYING BREATH! Every dime for his book is being donated to International Union for the Conservation of Nature! (IUCN) With Jack Hanna praising Tony's efforts and work he put into this book... again peeps... what are ya waiting for? Check out the shelves *cough I'm in the YA section cough*! You can't go wrong! There's never enough to choose from! I'm sure you'll find something you're looking for! Still here? Get movin!! Things are poppin at WAMM!!! I couldn't be more honored than to be with such a great group of Authors and with my release date moved up, I'm definitely fortunate to be in the line-up with some of the best!! Check my WAMM Authors page for many more. Check us out---I know you want to!! DO IT!! You'll be glad you did!! I always envisioned a day when the 'dream' would become real and y'all have made everything so pleasant... from the editing to the bookmarks; from the bookmarks to the marketing ideas---WAMM rocks! So, time is growing nearer to my release date. We have a plan to put into action and what a pleasure it is to work with such a great bunch of people. In a future post, I will be sharing my book teaser. Might let ya take a peek at a chapter... ya know I will. :) Later, I will be posting some of my fellow WAMM authors bookmarks and teasers! I just can't say it enough---I luv y'all!!! Please feel free to leave me a comment below, tweet me or follow me on FB!! I'm always interested to know what ya think! So this is it!!! The cover of my first YA Novel. The dream became a reality recently when I signed a publishing contract with Writer Amuse Me. After stumbling across their website, becoming a part of the writers forums, posting my story for critique and allowing a group of fantastic people to lead the way, I was finding a new home. I continued to send out queries and sent them exclusive, then waited to hear the response. Opening my e-mail during that time was no fun. I found myself almost not wanting to open them. I decided to give it another go with WAMM! When I got their response e-mail, I literally sat and looked at the computer--debating if I was ready to look at another rejection. Eight was enough to set in a depressing frame of mind, so I know how others feel when they talk about the counts that they send out. Nonetheless, I forced my finger to click the e-mail to open. I could not believe what my eyes were seeing! 'Hello Honey! We are pleased...' Wait! What!?! My eyes scanned the page quickly again. 'We are pleased to offer you a publishing contract.' Holy Shizzznittts!! They are pleased to offer me--me a publishing contract! For any writer, seeing this for the first time after sending queries, the feeling, I can only describe as overwhelming, was one I hope to feel again. Yeah, I admit it---I cried. Yeppers, I did! I had devoted my life to my girls and now, my acknowledgement was here! I am an author!! My emotions got the attention of my two youngest who came running into the room. I couldn't even speak---I merely pointed to the computer screen and the acceptance letter that I couldn't take my eyes off of. What did we do then?? We danced!! All three of us---jumping, dancing and me crying! I could not be happier than to be with an amazing group of people from WAMM. Dedicated, caring, work-a-holic and most of all supportive bunch of people ever!! I am sooooo pleased to say that my book is due to be released in November. Exact date will come later. Just look at that cover! Soon you will meet Shelby, Tristan, their best friends and the lurking Shadow Man. Visit WAMM http://www.writersamuseme.com/ to find other WAMM authors---you may recognize a few. Or, you can look on my tab for other WAMM authors and find their links! Hope to see ya at one of my signings! Did I just say that? My signings----yeppers----I did!!! A busy mom of five, and Honey to seven grandbugs, I somehow manage to find time to pound out some sentences, and miraculously paragraphs into novels, blog posts and more!